Most people know someone who is allergic to certain foods, such as strawberries or nuts. "Food allergy is one of the five most common allergies or hypersensitivitiesknown to affect dogs." Food allergy is one of the five most common allergies or hypersensitivities known to affect dogs. In a pet with an allergy, the immune system overreacts and produces antibodies to substances that it would normally tolerate. This excessive response is termed an allergic or hypersensitivity reaction. Many dogs will occasionally "react" to something they ate. This represents a food intolerance, or a sensitivity to a particular type of food, causing a mild gastrointestinal upset, rather than a true allergic reaction. In an allergic reaction to a food, antibodies are produced against some part of the food, usually a protein or complex carbohydrate. Since antibody production is required for an allergy to develop, food allergies usually manifest after prolonged exposure to one brand, type or form of food. What are the signs of food allergy? My dog just seems to itch and occasionally has diarrhea. 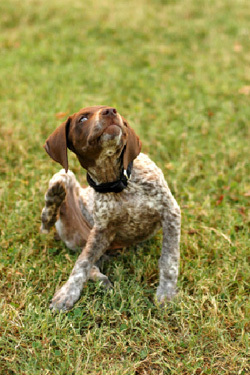 In the dog, the signs of food allergy are usually itchy skin or digestive disturbances such as vomiting or diarrhea. Other more subtle changes can also occur, including hyperactivity, weight loss, lack of energy and even aggression. The most common food allergens in dogs are proteins, especially those from dairy products, beef, lamb, chicken, chicken eggs, soy or gluten (from wheat). Each time a pet eats food containing these substances, the antibodies react with the antigens and symptoms occur. Are these the only food ingredients likely to cause food hypersensitivity? No, virtually any food ingredient can produce an allergy. 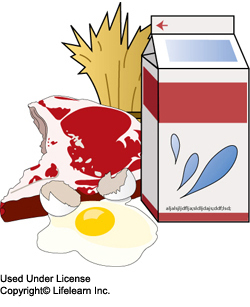 Proteins are the most common cause but other substances and additives can also be responsible. The best and most accurate method of diagnosing food allergy is to feed a hypoallergenic diet for eight to twelve weeks as a food trial called an "elimination trial". "...special diet must not contain any ingredients that the pet has eaten in the past." To be a true elimination trial for your pet, this special diet must not contain any ingredients that the pet has eaten in the past. This also requires that no other foods, treats or supplements be fed during the trial period, including flavored vitamins and heartworm preventives. There are blood tests that may give an indication of whether the dog is allergic to specific foods. These are called serum IgE tests and your veterinarian will discuss whether they would be of benefit in diagnosing your pet's condition. Once the offending food substance has been identified, a diet is chosen that does not contain these particular substances. Today there are a number of commercially available, palatable, hypoallergenic diets that can be fed for the rest of your dog's life. Your veterinarian can discuss the best choices for your pet, based on the results of testing. Occasionally commercial diets containing the right constituents are not available or your pet will not eat them. If this occurs, you may have to prepare a home cooked diet. The only treatment is avoidance. Some pets will require medication during severe episodes but most pets can be successfully treated with a hypoallergenic diet. "Dogs that have developed an allergy to one particular food may develop other food-related allergies in the future." Dogs that have developed an allergy to one particular food may develop other food-related allergies in the future. In addition, many dogs with food allergies have other allergies, such as atopy (inhalant allergy), flea allergy, etc. If you think your pet may have a food allergy, you should discuss this with your veterinarian, who can help your pet resume a healthier, "itch-free" life!